The Chop Cloc Should only be Fitted by a Qualified Electrican. 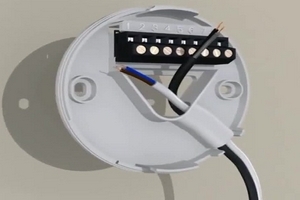 Establish the position of the main wiring centre and turn off the mains power supply to the system. Remove the back plate on the chop cloc by inserting a screw driver in the top slot. There is a cable way to accommodate another two twin cables or a five chord cable as conventionally used in heating wiring. If the unit is to be surface mounted remove the blanking plate from the cable way. Install the cables in the cable way and mount the unit. The connectors for power supply are 1 and 3. 1 is live and 3 is neutral. The connectors for control are 2 and 4. 2 is output and 4 is incoming. For the control wire you need to interrupt the connection coming out from the main timer. First wire in the power supply live and neutral. Then remove the incoming timer power output and use a connector block to connect the input wire to chop cloc. Complete the circuit back in at the point you disconnected the timer output. Chop Cloc’s main body can then be replaced onto the backplate and the wiring centre also replaced. Connect the mains supply through any nearby switched fuse. Power can then be restored. Chop Cloc is connected as if it were an external control. Extablish the position of the external control connector block within the boiler wiring. Remove the linkage and connect chop cloc between ouput and input across that. Mains wiring is connected as normal. Output at that point and return the output from Chop Cloc into the thermostat. If the thermostat is also a programmable timer this can be reversed and chop cloc wired downstream from the normally open connection. A nearby mains supply has to be sourced and choc cloc connected in a conventional manner. Connect live and neutral across that switched fuse. When all connections are secure mains power can be switched back on. Hi. Just fitted a chop cloc for a customer. boiler has 24v switching circuit what connections and what do i connectup to on the low voltage side of the chop cloc from the thermostat [24v] connections. Please advice on the model of boiler and themostat and I will get back to you.